Curramore Wildlife Sanctuary is home to a high abundance and diversity of wildlife, including 10 threatened vertebrate species. It protects a range of vegetation types, and forms an important corridor between neighbouring National Parks and other public conservation areas. Curramore is located about 90 km north of Brisbane, on the western escarpment of the Maleny Plateau in south east Queensland. Despite its relatively small size, Curramore is home to a remarkably high diversity of wildlife, thanks to its wide range of vegetation types and its connectivity to more extensive forest on adjacent land including the Maleny National Park. It is strategically located in the southeast Queensland biodiversity hotspot. 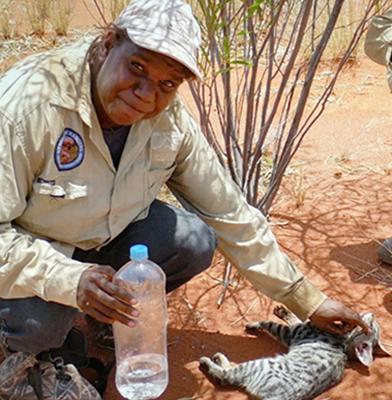 Here, AWC aims not only to protect an important suite of species, but also to demonstrate an effective response to one of the major threats to habitat in the region – invasion by lantana. 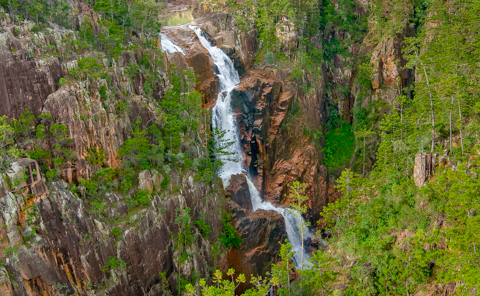 Elevation on Curramore falls steeply from 660 metres near the summit of Donavan’s Knob, one of the highest points on the Maleny Plateau, to 200 metres in the Mary River Valley near Conondale. The sanctuary encompasses most of the headwaters of Little Cedar Creek, a tributary of the Mary River. Annual rainfall ranges from 2,000mm on the plateau, to 1,200mm in lower elevation areas. The high rainfall, diverse geology, and sharp topographical variations of the property have combined to give Curramore a wide range of habitat types. Most of the property is dominated by tall Eucalypt or Brush Box forest with a vine forest understory, with a strip of grassy open forest on the eastern margin. AWC mapping has identified 29 vegetation types on Curramore, the most significant of which are those on basaltic soils, because most of these habitats of the Blackall Ranges are now cleared. Rhyolite, granite and basalt underlie the soils which support tall eucalypt and palm forest in the wetter gullies, and dry eucalypt forest on the slopes. There are several types of vine forest (rainforest) represented on the property, and a small but significant area of “dry rainforest” (microphyll vine thicket) with emergent bunya pines, found in the south-western corner of the property. The Maleny Plateau used to support an extensive cover of subtropical forests, but most has been cleared, with much of the remainder impacted heavily by weeds. Curramore Sanctuary protects a total of 279 species of native vertebrates, including several hundred species of birds and reptiles that dominate the forests during the day. Notable bird species are the colourful Noisy Pitta, Paradise Riflebird, Regent Bowerbird and Grey Goshawk. Of the 50 species of reptiles on the property, several are threatened, including the Elf Skink and Rose’s Skink. There are the large and obvious species like the Lace Monitor and Eastern Water Dragon, as well as the shy and secretive Three Toed Worm Skink and its predator, the Bandy Bandy. The canopy comes to life at night with possums and gliders, and threatened species like the Koala, Marbled Frogmouth, Grey-headed Flying Fox, and the rare Golden Tipped Bat searching for spiders. Down below on the forest floor are two species of pademelon, two (possibly three) species of Antechinus, a dunnart and a planigale, two species of bandicoot, and several species of native rodent. The 24 species of frogs present on the sanctuary include the threatened Tusked Frog and Marsupial Frog. There are also at least two threatened invertebrates at Curramore – the Richmond Birdwing Butterfly and the Pink Underwing Moth. At Curramore, AWC’s main focus is to demonstrate an effective strategy for the large-scale control of lantana (and other weeds) within south-east Queensland. At the time of purchase, more than half the land area of Curramore was infested with lantana, along with much of the remnant forest in the region. The forest was severely compromised, with lantana excluding almost all other vegetation and preventing recruitment to the canopy layer. Over the past 10 years, AWC staff and volunteers have undertaken a systematic control program, removing lantana and restoring the native ecosystem. Lantana (and other weed species) are killed with appropriate herbicides, removed by hand, and either burnt (with the aim to restore open forest) or mulched to encourage recruitment of native rainforest species. This program is well on the way to effective control of Lantana on Curramore, securing the future of its wildlife and, by demonstrating the feasibility of restoration techniques, hopefully acting as a catalyst for regional control efforts. The AWC science team tracks the ecological health of the sanctuary, by measuring a suite of indicators such as the diversity and abundance of small mammals and reptiles. Each year our staff undertake fauna surveys comprising of more than 2,000 trap nights, 700 camera trap nights and spotlighting surveys. There are also research projects investigating the response of diurnal reptiles to the removal of lantana, and the genetics of the spiny crayfish living in Little Cedar Creek. Despite its small size, Curramore sanctuary requires a relatively complex and partly experimental fire management strategy. 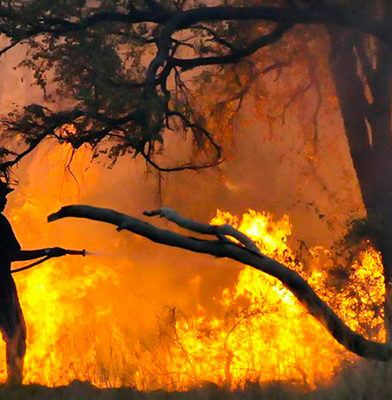 Fire is required for the long term maintenance of some habitats (Eucalypt forests and woodland) but needs to be excluded from other communities such as rainforest. AWC’s fire management on the property aims to maintain and restore a grassy understory in Eucalypt woodlands, retard the invasion of lantana and protect the rainforests. In this way, we will re-establish and maintain the mosaic of habitats required by the sanctuary’s wildlife. Curramore is lucky to have low densities of both cats and foxes. 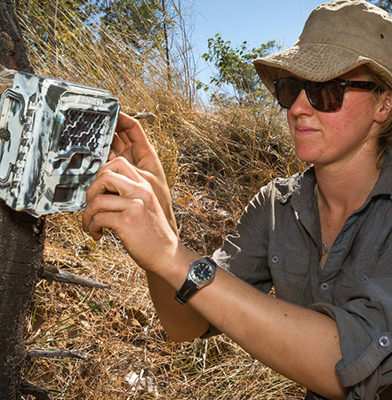 Camera traps are used to monitor populations, and they are removed opportunistically as required. A boundary fence on the western edge of the property is required to prevent neighbouring cattle entering the grassy woodland. The biggest threat to wildlife at Curramore is loss of important habitat through weed infestation. Lantana is the biggest problem and can severely damage an ecosystem – excluding nearly all other vegetation, and preventing recruitment to the canopy. On Curramore it is treated with herbicide, removed by hand and either mulched or burnt (depending on the habitat), with ongoing fire management being key to maintaining tall eucalypt forest. Neighbouring national parks and public conservation land share similar land management challenges, so AWC hopes to demonstrate an effective weed control strategy for the area.